Ever wondered about those small circles of mushrooms or dark circles on your lawn? Wonder no more; all is explained in my blog about this mysterious fungi. 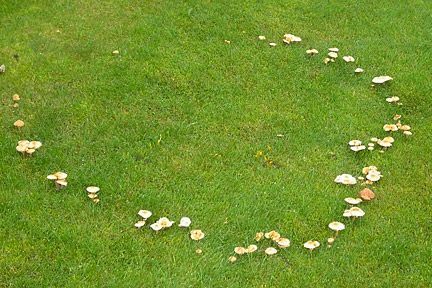 Mainly found in established lawns the Fairy Rings are caused by solid borne fungi that naturally occur in the soil underneath a lawns suffice. There are 3 common types in the UK. Over 60 species of Fungi have been know to be the culprits of creating these curious yet magical circles. The old wives tale of trying to dig the ring out just would not work as it is so easy to leave tiny particles of fungal mycelium that will just grow another ring. They can be found on all types of soil. They will appear on the surface of the lawn in various shapes and can spread year upon year. Sometimes the little sneaky fruiting bodies or toadstool can be viewed when the weather is suitable for the development of them. Any lawn disease needs to follow the principle of the Disease Triangle where there is a Host (Grass), a Pathogen (Disease, in this case our Fair Rings Fungi!) and an ideal Environment (Temperature and Moisture). When lawn owners enquire as to why they have toadstools on their lawn, it is mostly because they have always had the spores in the soil, just that the environments for the spores to germinate and develop and thus produce a fruiting body are ideal for that time of year. Type 1 rings appear as circles of dead or stressed turf bordered on both sides by lush green stimulated grass growth. You may see mushrooms or toadstools in the ring. The reason for the lush green growth on the outer circumference of the ring is the soil bacteria in the ring eating the thatch and fibre exuding Nitrogen, which in turn is a food source for grass. The reason for the dead grass within is a secondary by product from the bacteria and fungi namely a waxy substance that literally coats the surface of the soil particles meaning that they are unable to attract and hold onto available soilwater, and the soil becomes hydrophobic within the circle and watering with normal water will not resolve the issue. Type 2 fairy rings appear as darker rings of faster growing grass. Mushrooms or toadstools may be present in the rings. They are not usually as damaging as Type 1 rings. Applying fertiliser to the complete lawn, trying to miss applying fertiliser to the stimulated grass to deepen the colour and increase the growth can often mask them. Type Two rings to not damage the turf and the problem is more visually unsettling to the viewer. Type 3 rings have no detrimental effect on the quality of the turf. They consist only of mushrooms or toadstools. These mushrooms or toadstools may be in rings, arcs, lines, patches or solitary. They can be removed by brushing or mowing, which will also help to prevent the spores being spread. Can you eradicate a Fair Ring? To try to eliminate the ring you would need to try to eliminate part of the equation of the Disease Ring; i.e. the conditions. This potentially could be really tricky or quote hard work at least! If the surface that the rings are growing on is a dry one, wetting this area will assist in the prevention but trying to water the area with tap water may be problematic as the water will run off. A wetting agent will make it wetter and allow it to penetrate a really dry area. Spiking the grass will help to get moisture to the grass, roots and soil. When the soil becomes wet again the area can be grass seeded especially within a Type One Ring. There are no control products available to the every day gardener and even Green Keepers and Groundsman have a few available. Digging out the infected area, removing and replacing the turf and soil may help also. Fair Rings are naturally water repellent. Preventing them is better than a cure! Buying a specialist Wetting Agent is good advice and following the instructions that come with it is the best course of action. Applying this agent requires continued commitment however.